Well I went photographing birds this morning. The first time in more than a year. I finally got myself a lens and it is working great so far. I went down to the local park and down to the creek. There were only common birds but I wented to test out the lens to make sure it was sharp and did not have a focus problem. 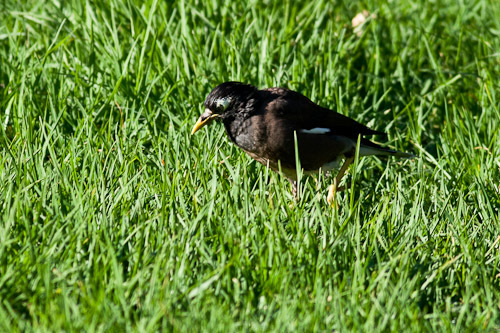 A common Indian Mynah was feeding on the grass in the park with a couple of Magpie-larks. There are lots of them in the parks around Melbourne. 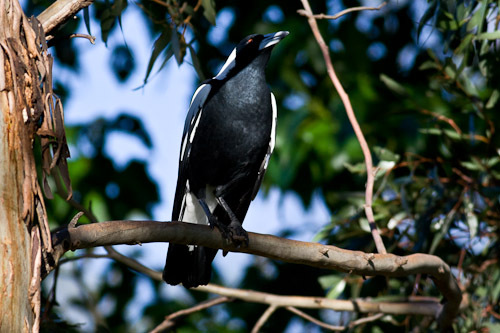 A magpie swooped down on them and they scarpered off. 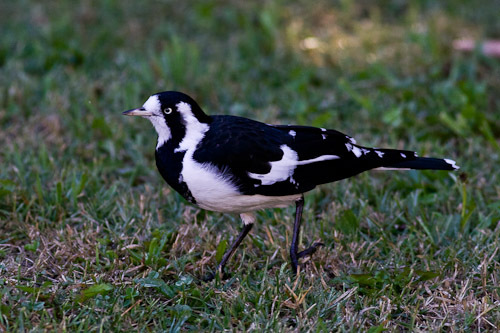 Magpies are very territorial and aggressive. This one hung out in the tree to make sure they did not come back. 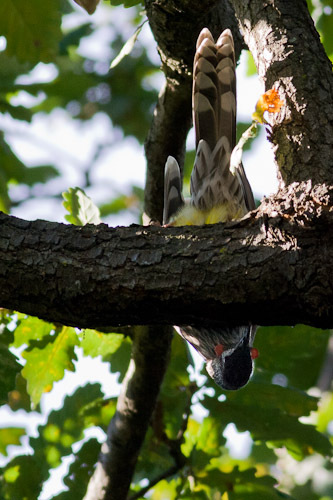 This Red Wattlebird made a violent racket and then proceeded to hang upside down. It is a bit dark but its a really interesting pose. 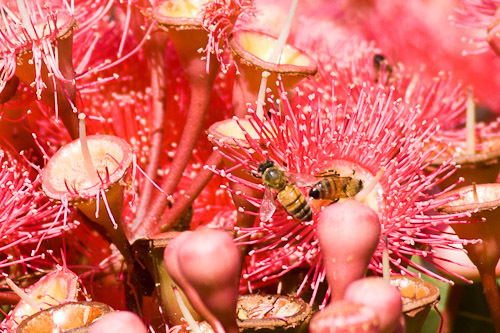 On the way back in the street a gum was in blossom and the bees were feeding like crazy on the nectar. Well that is about it. The lens is working good. I am back into it. Well I am back in Australia now. I had to get to Melbourne. I started off at 10am waiting for the bus to get into the center of Newcastle to get the shuttle bus to the airport. 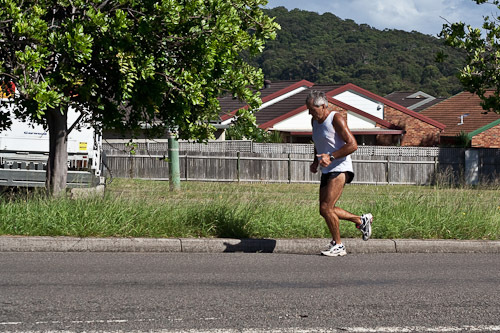 This jogger came past while I was waiting at the bus stop. Newcastle busses are horrendous. It is not hard to work out why hardly anyone uses them. The one I got was fifteen minutes late and I almost missed the shuttle to the airport. You almost need a car to get anywhere in Newcastle. Public transport is horrendous. In comparison public transport in Melbourne is very good. 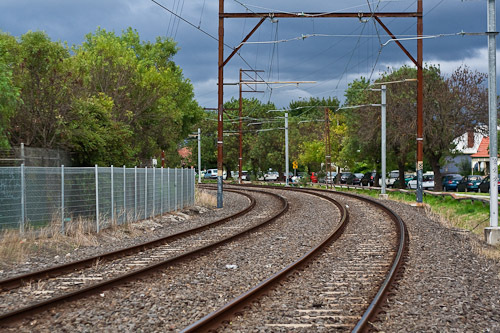 There are numerous trains, trams and busses that will get you around the city very easily. 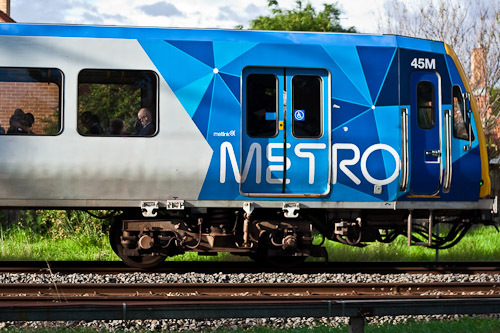 The airport shuttle from Melbourne’s Tullamarine airport is ready to go in minutes and takes you to the Southern Cross train station in the middle of Melbourne. I just got off the airport shuttle and caught a tram to where I wanted to go to in the suburbs of Melbourne. No problem. 2010 – 2011 Season Highlights. I thought I had better do a 2011-2012 Japan trip highlights and retrospective just to look back on my recent trip to Japan. This is only a brief taste of the travel and skiing that I did in this trip. It started off in Osaka, where I had a great outing to the Kuromon markets, where there was a fantastic array of food displayed, mainly sea-food and tempura. The fugu were the highlight for me, I reckon. 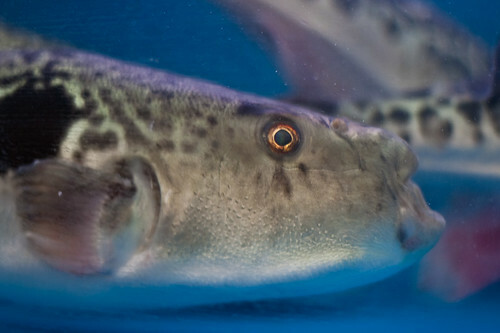 I love to photograph the fugu, but no way am I going to eat some. 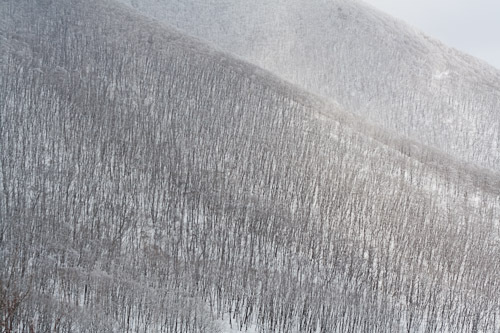 I got early to Furano, arriving on the twentieth of December and get some early snow falls. From around Christmas Day, the snow got really light and fluffy. I think I got my arrival spot on. 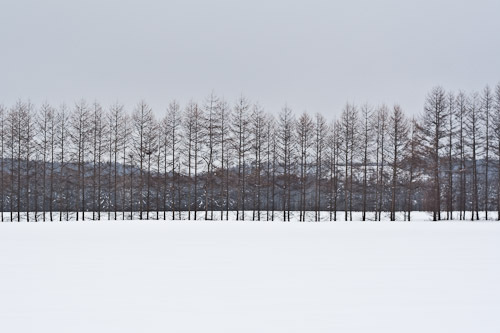 My estimate is that the prime time for Hokkaido is from just before Christmas to around the middle of March. Before and after that, the snow gets a bet wet and heavy. 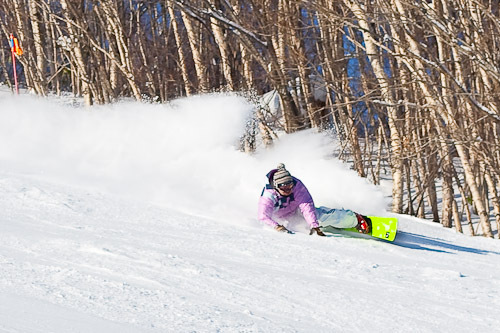 I loved taking photos of the extreme carvers on their snowboards. This guy has popped out his rail and then just popped it back again and made the turn. Aweseome! 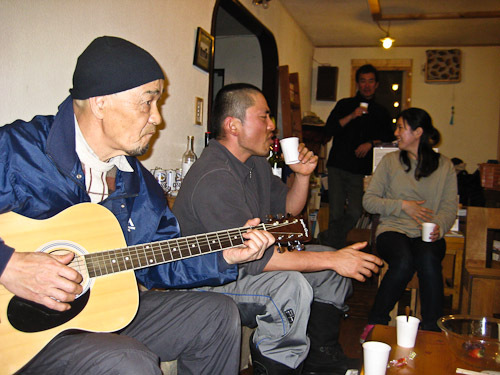 I only went to a couple of the Cultural nights at the Kitanomine ski-jo. The first one was great with the belly paintings. 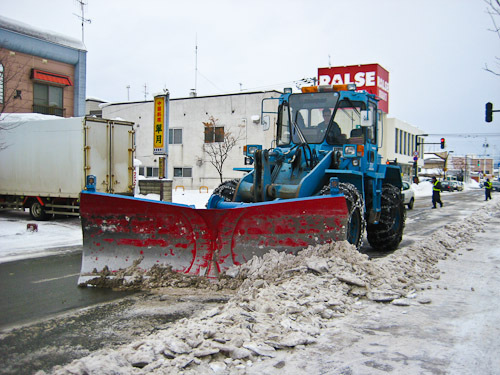 I enjoyed taking photos of the snow clearing machinery, especially the snow munchers which chewed up the snow and dumped it into the back of trucks, and the snow ploughs. The local shinto temple was interesting, with lots of photographic and cultural facets that I had fun with. This is a lion dog which is supposed to guard the north-east corner of the temple from the bad spirits. 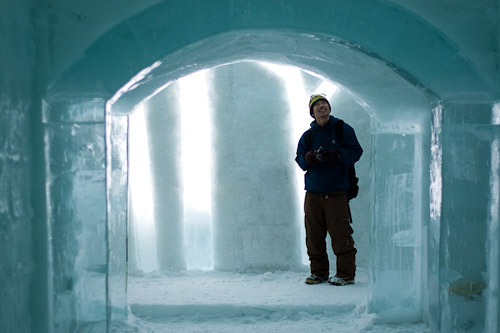 The trip to Lake Shikaribetsu to see the igloos and ice bar was fantastic and surreal. And back to Osaka on the return leg, I had some takoyaki at the source. 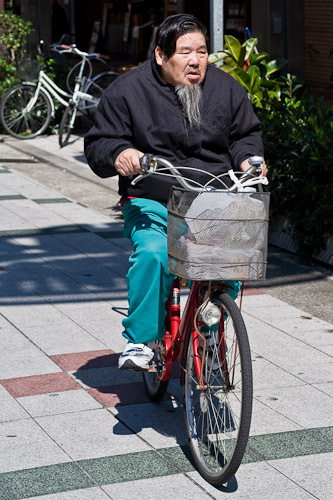 Did some more street photography and had a great bike ride from near Osaka to Arashiyama. All in all, this season in Japan saw some great falls of snow, I had some epic powder skiing, and had some awesome photographic opportunities. I cannot wait for next year. Ganbatte! After my exhausting bike ride to Arashiyama, I had a good sleep in and then went out for the afternoon with the intention of taking photographs of the people of Osaka. I started off in the Shin-Sekai area which is a tourist area with lots of shops and eating places where you can sit or stand at bars and eat snacks and drink beer. 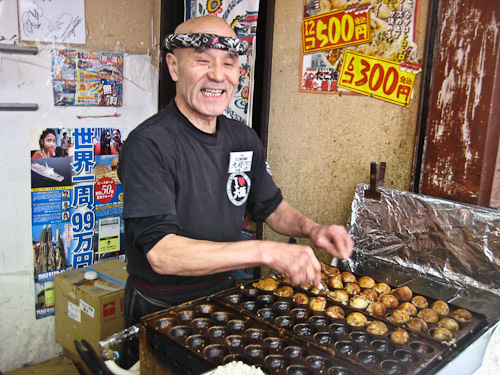 Of course I had to try the takoyaki of Osako, which is famous throughout the world. 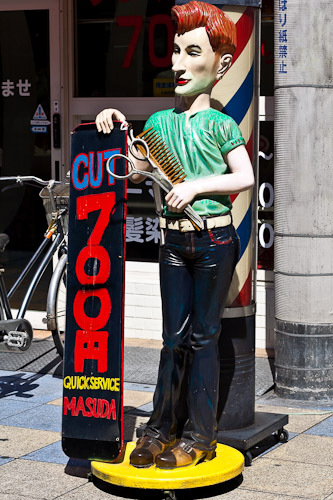 This is the cheapest haircut that I could find, 700 Yen or less than ten dollars. The statue out the front of the shop looked rather ambiguous to me. 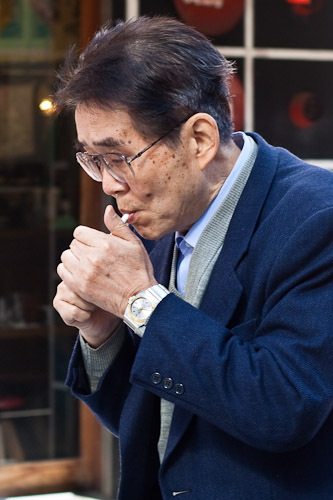 I wandered around the shopping and restaurants of Shin-sekai taking photos of the locals and tourists. 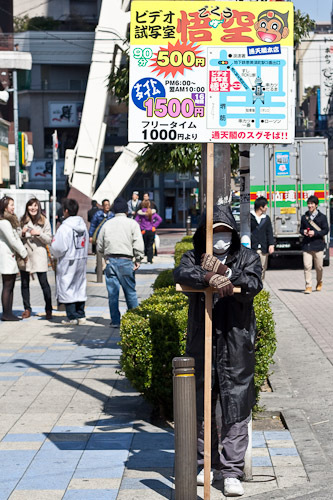 This man stood here in the street nearly all day advertising parking spots, I think. I came back later in the day and he was still there. This guy was riding down the footpath of the main shopping area. 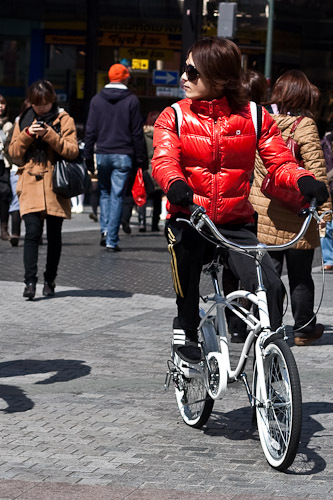 People ride bikes anywhere they feel like in Osaka and you have to keep your eyes out or they will run you over as soon as look at you. 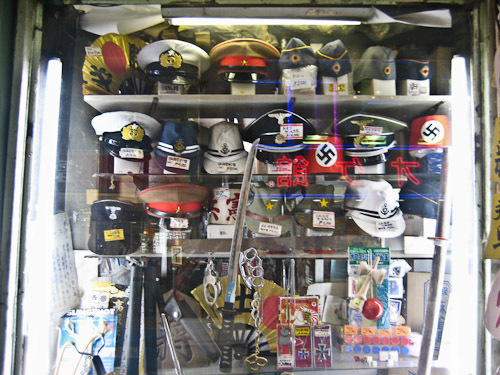 Past Namba, I stopped at the bridge over the river in the shopping area, where all the trendies congregate. 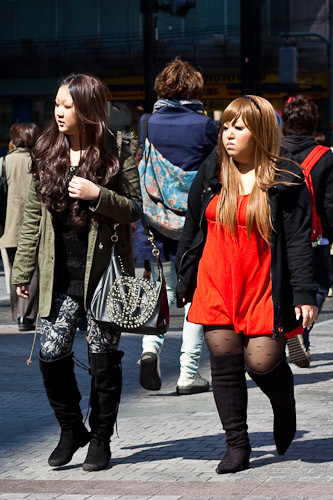 The fashions of Japanese cities are quite extraordinary. I am constantly amazed at what people are wearing. This dude on the bike was pretty cool. 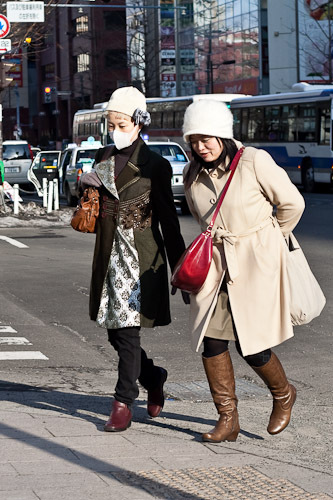 Puffy shiny jackets are in in Japan. The ladies have an enormous array of “looks” that they present. Sometimes it feels that they are trying to portray some characters out of an anime film. These girls had the rock chick thing happening. Pretty grungy. Note more big boots. This boy and girl had some sort of tartan thing happening. Tartan and checks seem to be big in Osaka this week. And of course the Salary Man off on a lunch break before heading back to the office. Floral flowing long dresses have a lot of adherents. It is almost a retro seventies feel to it. And of course the ever-present J-boy. Well groomed with big bouffant hair and pointy shoes. Man bags are very popular with the men as well. And some more rock chick thing happening. 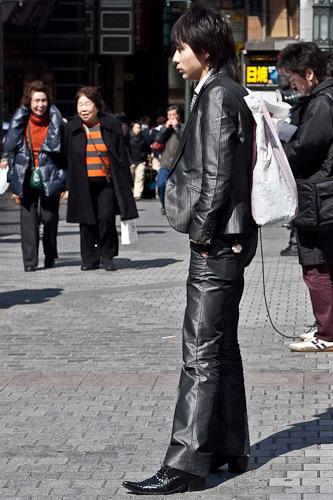 Big boots are all the rage, just like everywhere. The soft earthy look again. Very popular. More grunge, but very artfully arranged. And the rock chick thing again. 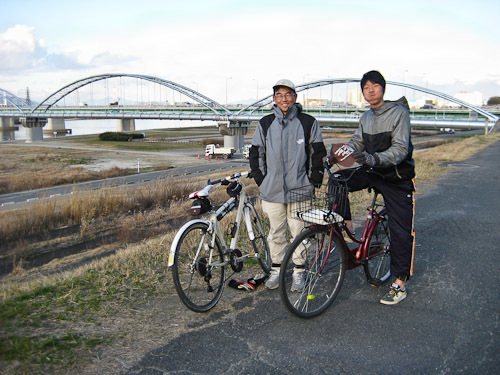 Here is Takuto and Toyo at the river in front of the Togetsu Bridge at the end of our marathon 33 kilometer bike ride to Arashiyama against a howling head wind. We started off at Hirakata which is west of Osaka. 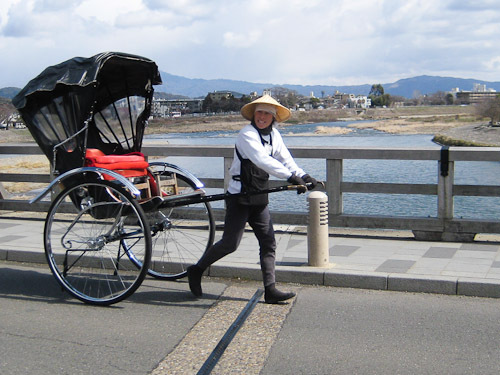 We left our bikes on the other side of the river and walked into the town of Arashiyama over the Togetsu Bridge. 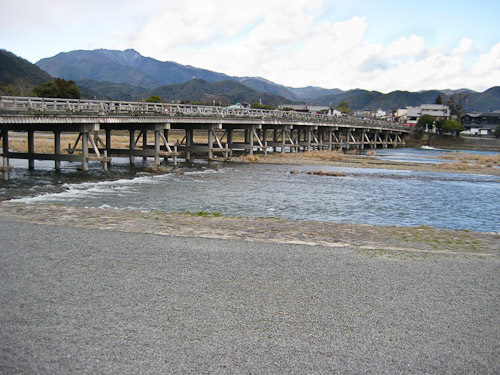 Togetsu means “moon crossing” – this bridge was named by Emperor Kameyama because of the resemblance to that phenomenon. Arashiyama has been a popular tourist destination for more than a thousand years, noted for its natural beauty, mainly cherry blossoms and fall colours. There are quite a few Zen temples in the area and I think one of them has been designated as a world heritage site. 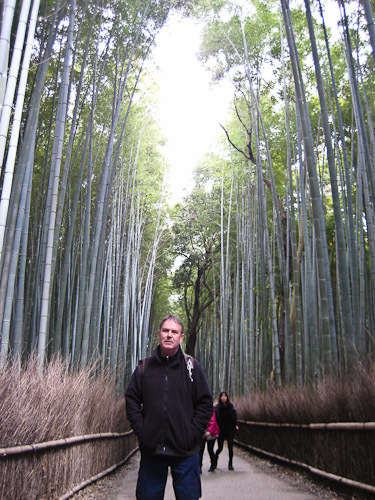 The bamboo forests around Arashiyama are some of the most beautiful in Japan. 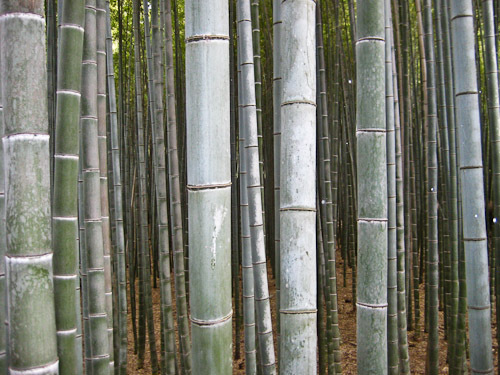 The sound of the wind in this bamboo forest has been voted as one of “one hundred must-be-preserved sounds of Japan” by the Japanese government. We had a buffet style dinner (Kyoto “Obanzai”) at one of the restaurants where we could eat all we wanted for an hour. I had about 3 dishes and tried nearly everything that was put out. I did not like any of the slimy dishes but loved the wasabi vegetables, french onion with mayonnaise, tempura, deep fried fish and pork. The dessert of custard and cream was absolutely delicious. After our feed we went for a walk around the town and saw the Jyojyakkouji temple and the Rakushisya Residence which is a thatched hut that belonged to the 17th century haiku poet Mukai Kyorai. Mukai was a student of Basho Matsuo, one of Japan’s greatest poets. Back over the bridge we went and back on our bikes, stopping at Sewaritei, in the Kyoto district, riding along the Yodo river. After another 33 kilometers we found ourselves back at Hirakata. At least the wind was at our backs on the return journey so it was much easier. 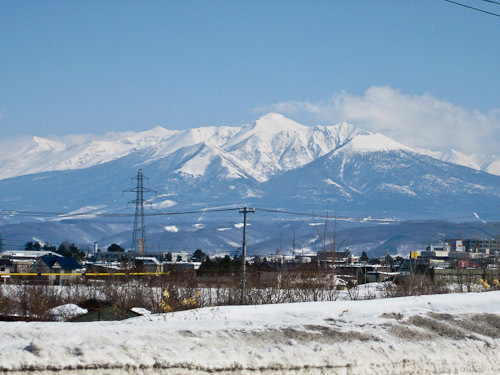 It seems like forever but it was only yesterday that I left Furano. Spring has struck with a vengeance and the snow was getting all slushy and yucky, so it was a good time to leave. 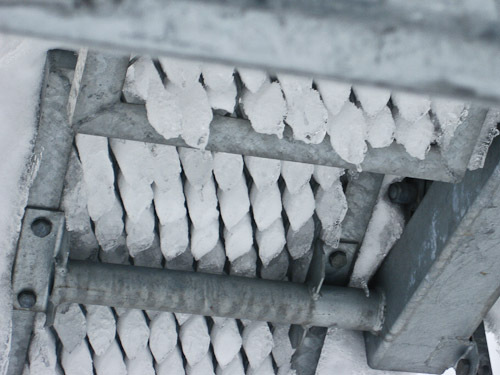 It was so hot that the snow was melting through the grating in the chair lifts, making ice blocks. I got a lift down to the Cosmo gas station to catch the bus to Sapporo. Whilst waiting I took a few snaps of Tokachidake. It was one of the rare days that you could actually see it. It is usually covered in cloud. 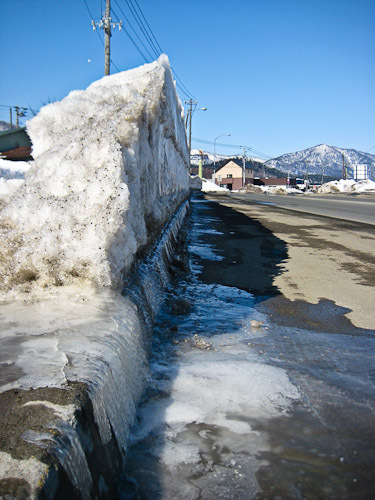 The snow had just been eaten by the snow muncher so there was this great big wall along the side of the road. I got on the bus and it took ages to get to Sapporo. It was so slow. I found my hotel and checked in and then went for a walk to the station to get some photos. I just stood at the lights and took some photos of the people. 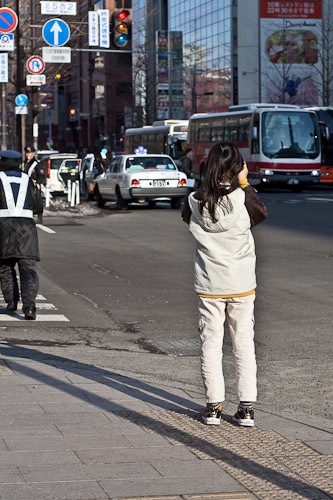 This young girl was darting in and out taking photos. She was so cool. 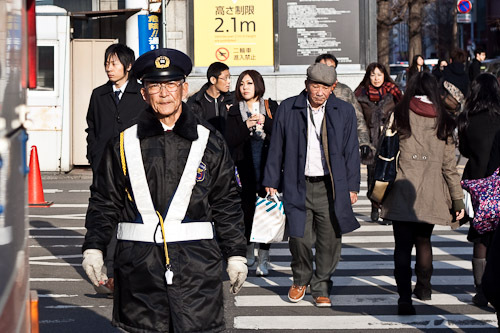 There are heaps of parking attendants directing cars to the various parking spots. This guy was taking his job seriously. 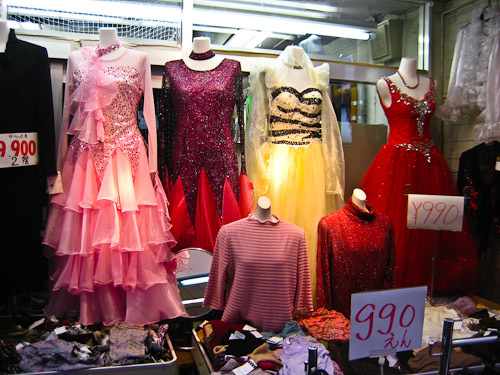 Later on I took a walk down the street with all the markets and found this shop with the latest Hokkaido fashions. How cool do they look? 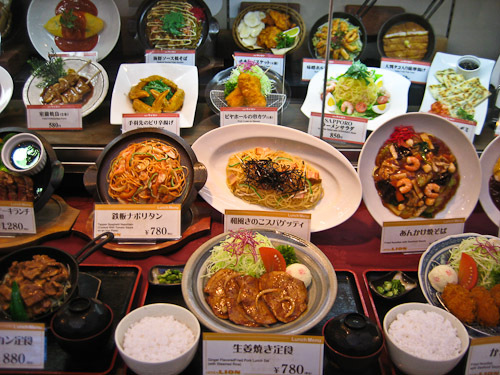 Most of the restaurants have plastic meals out in the window of their shops with the price on them. It is better than putting real meals in the window because they would go all mouldy and rotten. I am pretty certain that there is a town somewhere with a thriving industry making plastic meals. I do not know what to say about this photo. I am just flabbergasted. When I walked past this shop I did a big double-take. This morning I caught a flight from Shin-Chitose to Osaka. I flew with Peach who are a new budget airline. They were pretty disorganised so I might not fly with them again in a hurry. I am in Osaka now and it was raining this afternoon. I hope it is a fine day tomorrow because I am going for a bike ride. 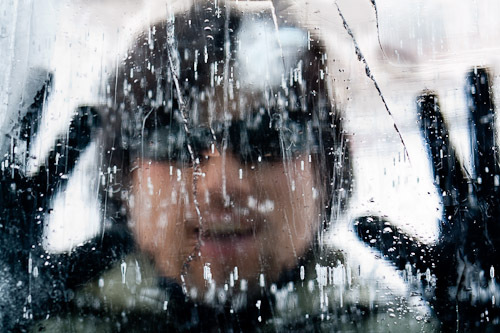 Today I got invited to go to Lake Shikaribetsu Ice Bar with the local crew. Lake Shikaribetsu is about a hundred kilometers south and east of Furano in Central Hokkaido. We travelled south towards Shintoku and then went east until Shikaoi and then went up the mountains into the National Park to the lake. 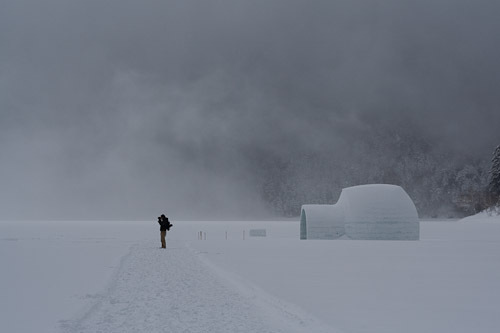 The lake is frozen over and they have built an Ice Bar and an igloo village out of blocks of snow and ice. This is Joni behind a big ice block. There was an almost stained glass effect in some walls where they made patterns out of sheets of ice. 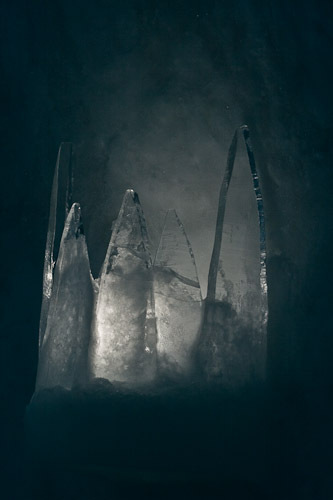 Here, Hiro is blacklit by one of these ice sculptured walls. 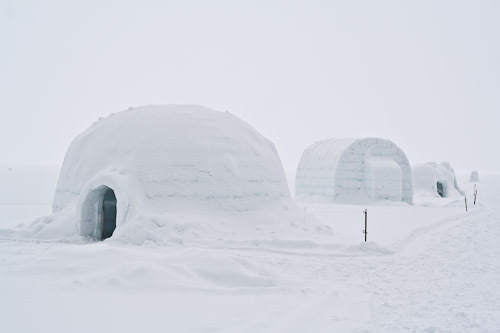 The igloos are out on the lake. There is also a hot spring there but no-one was game to give it a go. Here is Gareth taking a photo out on the lake. 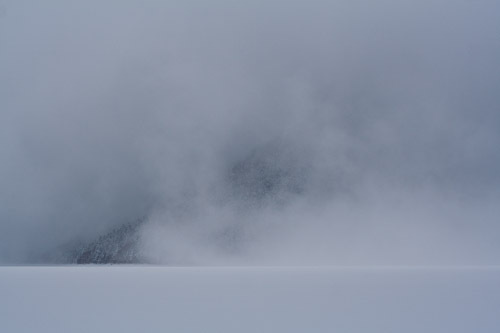 The clouds were drifting in and out, partly obscuring the wooded hills behind the lake. A light in the Ice Bar caught my eye on the way back. On the way back I snapped some shots of the bush as we were going past. 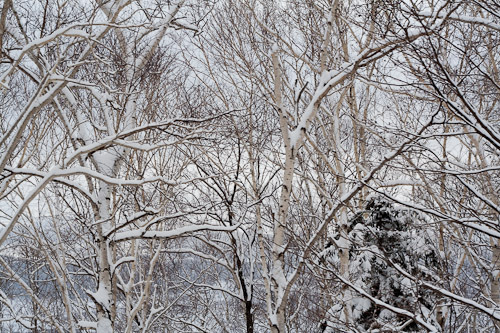 I quite liked the texture and contrast of these trees against the snow. 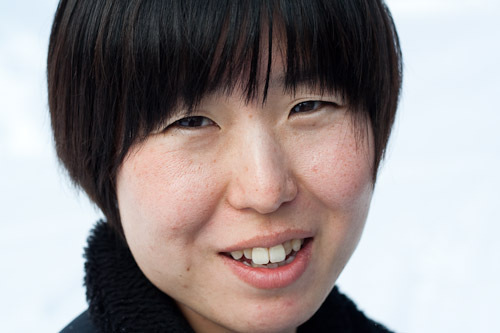 We stopped for lunch at Shikaoi and I snapped this portrait of Joni. And this one of Yuki. We stopped in at Sahoro Ski Resort and had a quick look at it from the bottom. It looks pretty good. I went out for a ski this morning but the snow was very wet in the trees and icy on the runs. I was not at all impressed so I took the camera for a walk to go and get a free dinner. 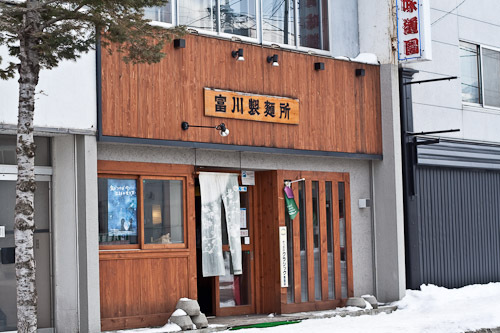 I had won a voucher at the Cultural night a few weeks ago, so I set out to claim my prize – 1000 Yen worth of food from the Tomikawa Seimensho restaurant in Furano town. This is the fantasy realm that I inhabit. 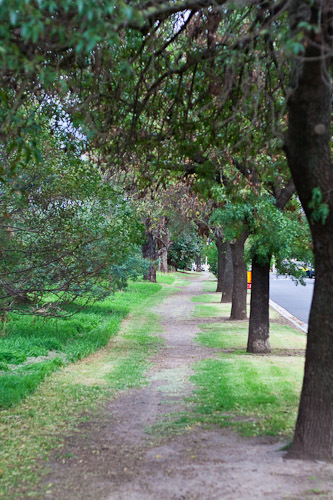 The corner where the signs for Maccas and the Forest supermarket are situated. It is not tacky at all, is it? 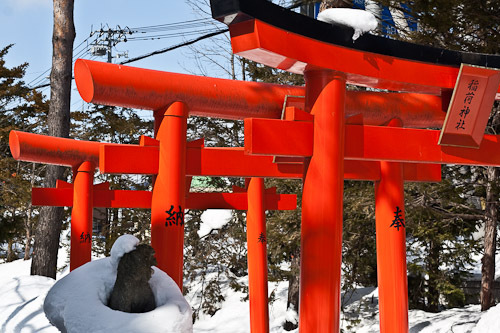 A torii is a traditional Japanese gate usually found at the entrance or inside a Shinto shrine. It symbolizes the transition from the profane to the sacred. They were probably first built around the tenth century. 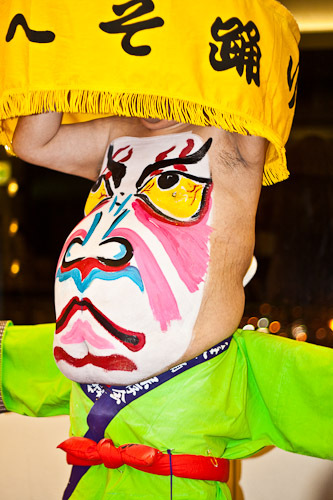 Inari or Oinari is the shinto deity of rice and prosperity for farmers. Oinari’s messenger is the magical shape-shifting fox Kitsune. 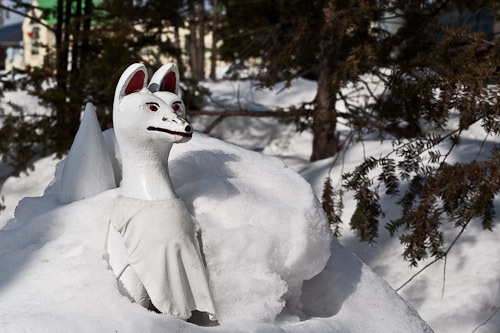 Fox statues are often placed in north-east corners because this is the place that demons gather and enter. 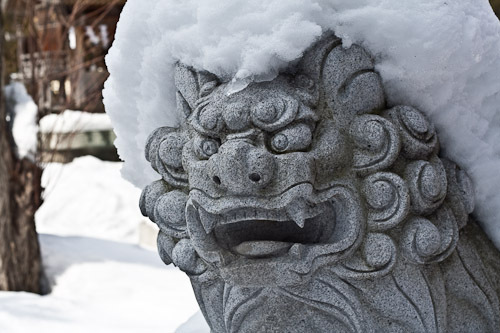 Komainu are often called lion-dogs and guard the entrance to many Japanese Shinto shrines. They are meant to ward off evil spirits. They come in pairs – one with mouth closed and the other with mouth open. Guess which one this is. The open mouth is pronouncing the first letter of the Sanskrit alphabet, “a” and the second is pronouncing “um” and together they sound Aum, or Om as we say. 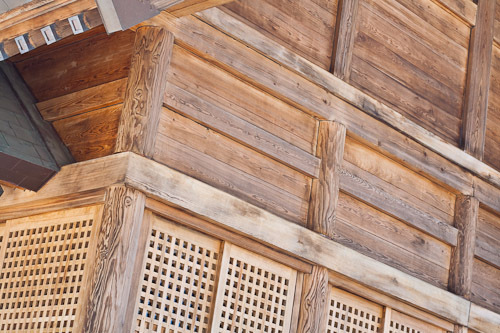 The wood in this temple is wonderful. It has such amazing textures and shapes. 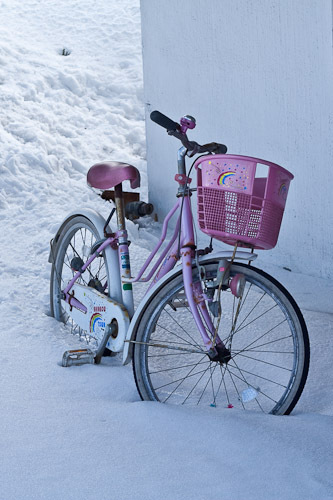 Down the road I came across this bike that had been left out in the snow. It looks sad and abandoned. Won’t someone come and ride me, it is saying. I had Shoyu Ramen with lots of pork. I could not read the menu so I just asked for what the guy next to me was having. Luckily it was 800 Yen, less than the amount of the voucher. The bowl was huge and I was full up to the max. Oishiii. 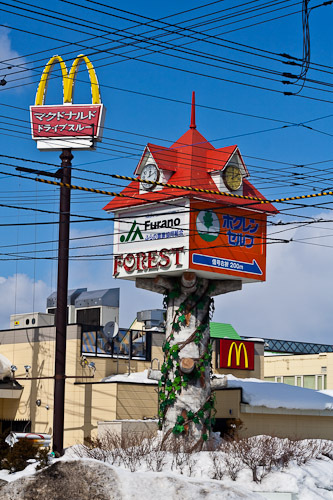 We have been partying hard in Furano the last week or so. 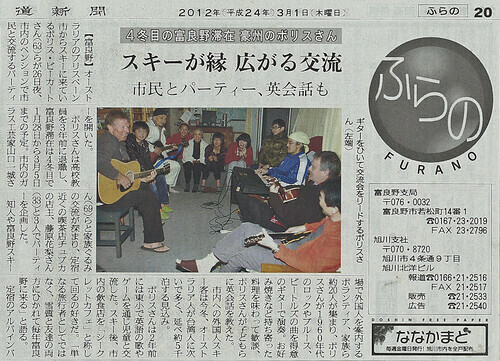 Mainly just playing guitars and singing with our lovely Japanese friends. 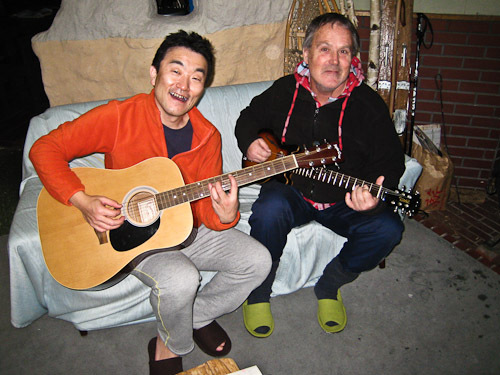 Nori brought his electric guitar which has an inbuilt amplifier built into it. 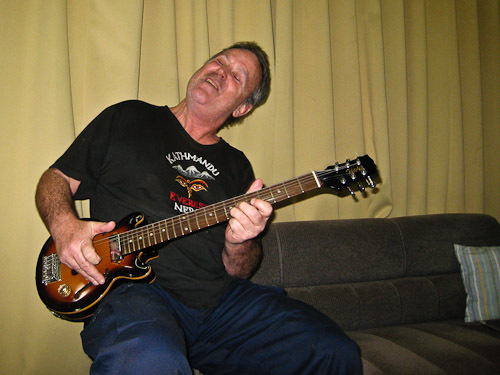 I had lots of fun playing it and pretending that I was a rock star. 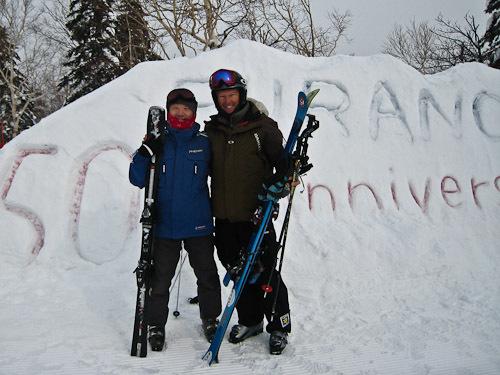 Nori is a great skier who lives near Tokyo and usually skis in Hakuba. He plays some great guitar as well and it was a great pleasure to play along with him. 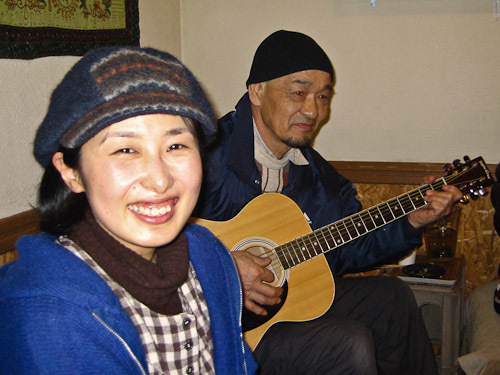 We had a party on Sunday night where we invited lots of Japanese friends and played some music and had some fantastic food. Kazuki made the awesomest Okonomiyaki which tasted so good. I am on the right in this photo. A reporter from the Hokkaido Shimbun came around and took some photos and they did an article in the Hokkaido newspaper and Boris and communicating through music. I think that is what it says, I have no idea, doh! 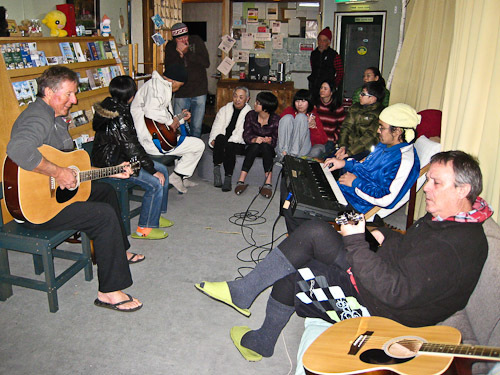 Then last night we had another get-together and made some music and had a little food. We are non-stop party people here in Hokkaido. The craziness just never stops! 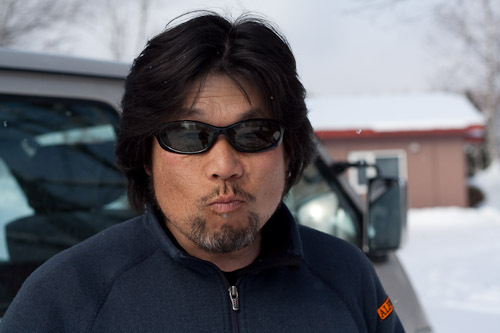 Toku is a Taiko drummer and ski instructor in Furano. Hiro has a restaurant with his wife, Em, called Senggoku. They do the most amazing dinners for really cheap. Lovely people. 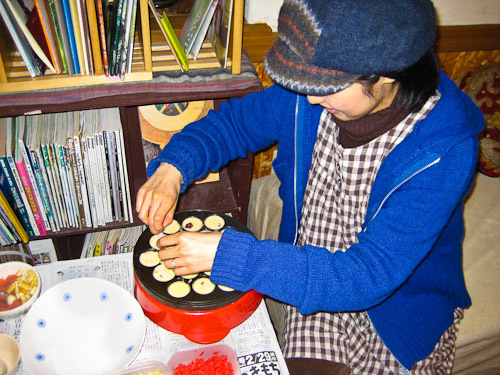 I helped Noriko to make some takoyaki. They taste sensational. Takoyaki means fried octopus in Japanese and is a popular ball-shaped dumpling made of batter and cooked in a special takoyaki pan. We put in the batter first and then filled with diced octopus, pickled ginger, and green onion. 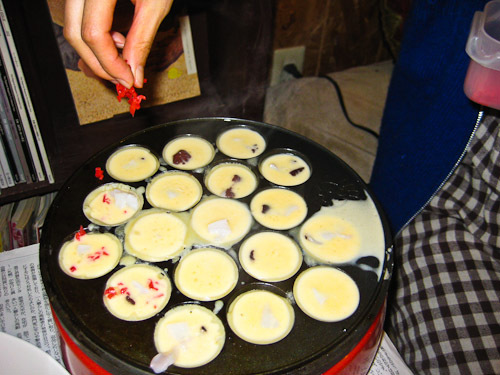 The takoyaki were rolled with a skewer until browned. Then we squirted on takoyaki sauce and mayonnaise, and topped with katsuobushi (shavings of dried bonito). It was first made in Osaka and I have seen them making them there in the Shin-sekai district. I will try some again when I get back to Osaka. 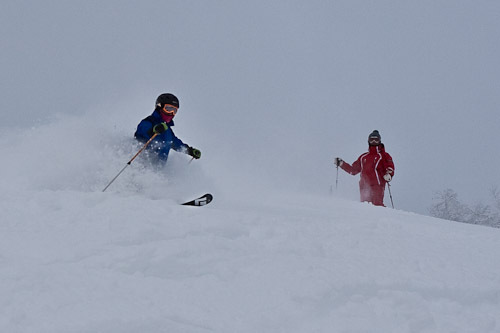 Then finally after all that party madness, it is back to skiing. whew! The top four photos and the feature image are from Nori’s camera and the rest are mine.